A month ago I got you up to speed on scandals involving the haven of heretics known as TBN in Trinity Broadcasting Network Fires Back Regarding Financial Fraud Allegations. The Trinity Broadcast Network (TBN) said Tuesday that a civil lawsuit filed against it by the founders’ granddaughter and the company’s former finance director is “meritless and contrived,” adding more arguments to what has become an epic scandal involving the largest Christian television network. 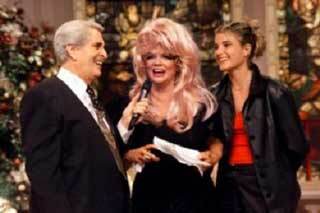 For 39 years, the Trinity Broadcasting Network has urged viewers to give generously and reap the Lord’s bounty in return. The prosperity gospel preached by Paul and Janice Crouch, who built a single station into the world’s largest Christian television network, has worked out well for them. Mr. and Mrs. Crouch have his-and-her mansions one street apart in a gated community here, provided by the network using viewer donations and tax-free earnings. But Mrs. Crouch, 74, rarely sleeps in the $5.6 million house with tennis court and pool. She mostly lives in a large company house near Orlando, Fla., where she runs a side business, the Holy Land Experience theme park. Mr. Crouch, 78, has an adjacent home there too, but rarely visits. Its occupant is often a security guard who doubles as Mrs. Crouch’s chauffeur. The twin sets of luxury homes only hint at the high living enjoyed by the Crouches, inspirational television personalities whose multitudes of stations and satellite signals reach millions of worshipers across the globe. Well, as you’ll hear in this interview airing yesterday with Brittany Koper, conducted by Jackie Alnor of Apostasy Alert below, more very disturbing detail comes out concerning Trinity Broadcasting Network. I’ve been warning you that even Word Faith Heretics Like Creflo Dollar Draw Nearer To Evangelical Acceptance. Though he’s a bit distracted right now as Word Faith Heretic Creflo Dollar Arrested For Battery And Cruelty. More than that, it also inserted Jakes into the younger sector of the New Calvinist camp as well. What’s this to do with TBN? Consider ER 2’S T.D. Jakes Says TBN’S Paul CrouchLed By God To Launch Jakes’ Ministry. And how about this bit of lunacy in the Lord’s Name: Southern Baptist David Jeremiah Praises “Vision God” Gave To TBN’S Paul Crouch. Well, from a family member and TBN insider, see what this “vision” apparently involves. She may have been an heir apparent to the world’s mightiest Christian broadcasting empire, but Brittany Crouch Koper grew up in Irvine thinking she was a regular kid… [However, h]er grandparents are Paul and Jan Crouch, founders of the Trinity Broadcasting Network empire,… And now that empire is under attack, largely due to Koper herself.